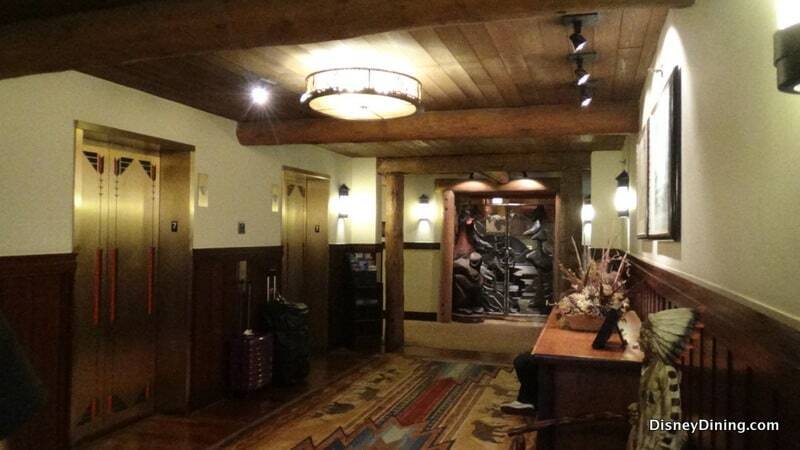 My wife and I recently married, and though we usually stay at in the Villas portion of the Wilderness Lodge, we reserved one night in the Concierge Level of the main Lodge itself for the day after our ceremony. 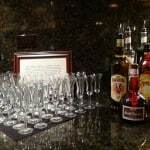 As you may know, the price of the Concierge Level (or CL in the parlance of Disney) includes near round the clock buffets at the Old Faithful Club: continental breakfast, snacks around lunch, heavy hors-d’oeuvres during the early evening, and a late-evening ending dessert buffet offered with complimentary cordials. What we found were some unique and enticing options. Breakfast offers a solid selection of pastries, cereals, fruit, coffee, tea, and juices. 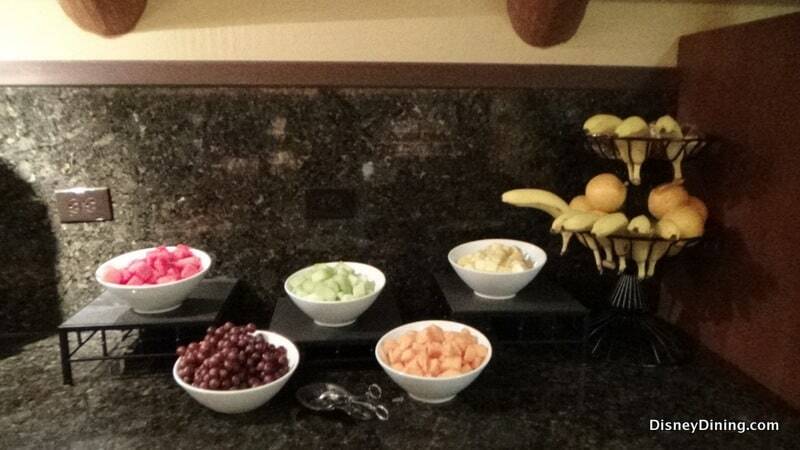 The fruit was fresh-tasting, not the often cardboard taste of fruit one gets when you dine at many breakfast buffets (including some at Disney). That extra freshness somewhat helps to lessen the impact of a CL room’s cost. . .somewhat. Already cut up for you were watermelon, honey dew, cantaloupe, and pineapple (fresh not canned); additionally, there were whole grapes, bananas, and grapefruit. The cereals were nothing special nor were the pastries, but you could brew yourself a serious cup of tea as they were well over a dozen different types of tea from which to choose. The coffee was decent, but being a bit of a coffee snob, it didn’t quite measure up to my tastes (we grind our beans fresh every morning at home). The offered breakfast drinks included orange, cranberry, and apple. I only tried the OJ but can attest that it was better than average, as in not out of a can. 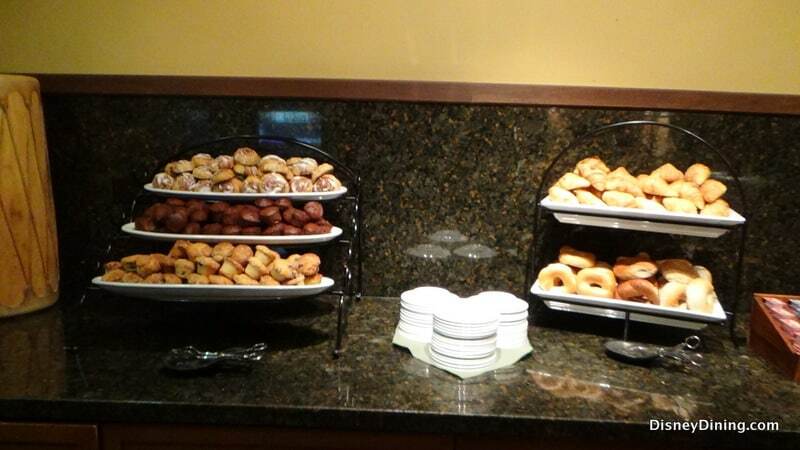 The primary thing lacking in this buffet is a hot item or two. 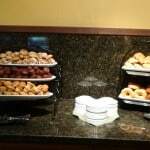 Yes, I know it’s a continental breakfast buffet, but it would be nice to at least have something a little heartier than a bagel and cream cheese. 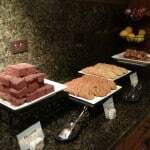 On the other hand, compared to the lunchtime snack buffet, the breakfast selections seemed downright luxurious. 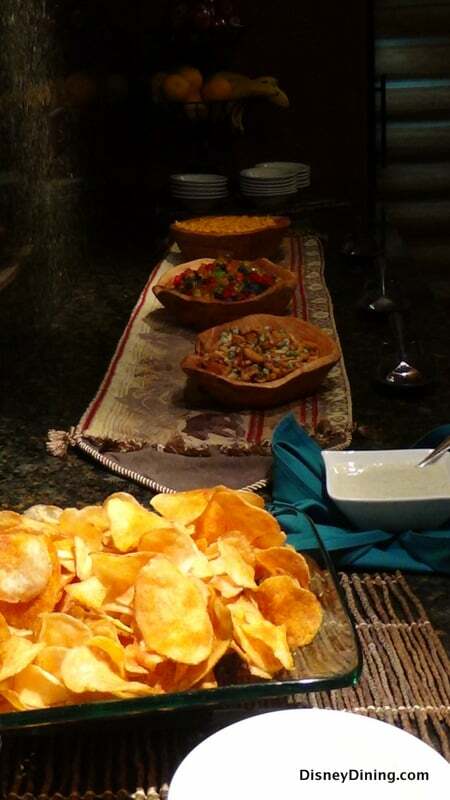 This particular buffet is the one negative note to our CL experience, though unlike breakfast, there was one warm offering—homemade potato crisps. If you tend to eat lunch, then this is not the spot for you, that is unless you want gummy bears, cheesy fish crackers, and an Asian “inspired” snack mix. Oh, there were two kinds of cookie, as well. Quite disappointing and, in truth, I would urge them to discontinue this portion of the CL buffet service as it seems very low-rent. It’s a good thing we hadn’t planned on eating lunch there. I will admit that the homemade potato crisps were quite tasty—lightly coated with seasoning salt and served with a ranch dressing, it wouldn’t be too difficult to eat yourself into a potato chip coma. Still, that’s the only thing I can recommend. 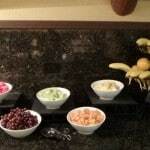 However, both the evening hors d’oeuvres and late evening dessert bar helped compensate for such a poor midday offering. The first of those two displayed some delightful choices: an artfully arranged, crisply fresh salad; cold cuts with veggies; fresh bread with accompanying sauces; and crackers with a variety of cheeses including bleu, cheddar, and Monterey Jack. Further, there were chicken skewers being kept warm by a salamander (the light not the lizard) which could be dipped in one of two sauces, BBQ and sweet-n-sour. The chicken desperately needed seasoning, but if you did opt for one or both of the sauces, then they were passable. 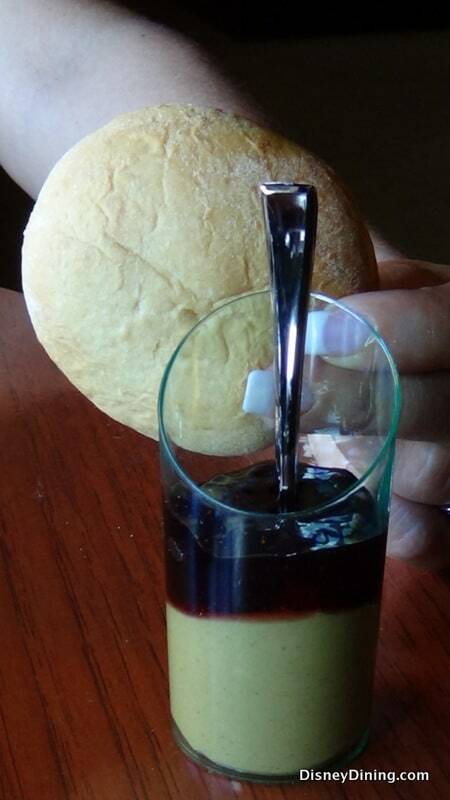 The dipping sauces for the bread—one was a romesco-style, tomato-based sauce—were excellent. The vegetables and salad makings could be combined for a filling meal alone. If you’re a light eater at dinner, there are plenty of options to satisfy your cravings. 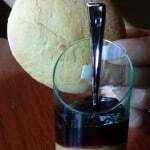 My favorite was the peanut butter shooter, complete with a roll in which to stuff the contents of the shot glass. Not only was it everything a PB & J should be, it was delightfully wacky. 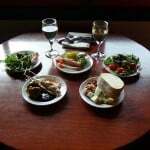 Available with these appetizer-style foods was wine, featuring a Chardonnay and a Cabernet Sauvignon both from Washington. The Chardonnay wasn’t too oaky, but it did have that West Coast buttery style that many folks don’t like. The Cabernet Sauvignon was pithy, full of berries, but was not otherwise distinctive. Then again, both are “free.” Drink away if you wish. After wandering the parks for a couple of hours that evening, we came back just in time for the late evening dessert buffet featuring a piping hot berry cobbler on a hot plate. The cobbler is quite generous with its berries, though the doughy part of the dish needed some cinnamon, nutmeg, and vanilla as it was too bland. 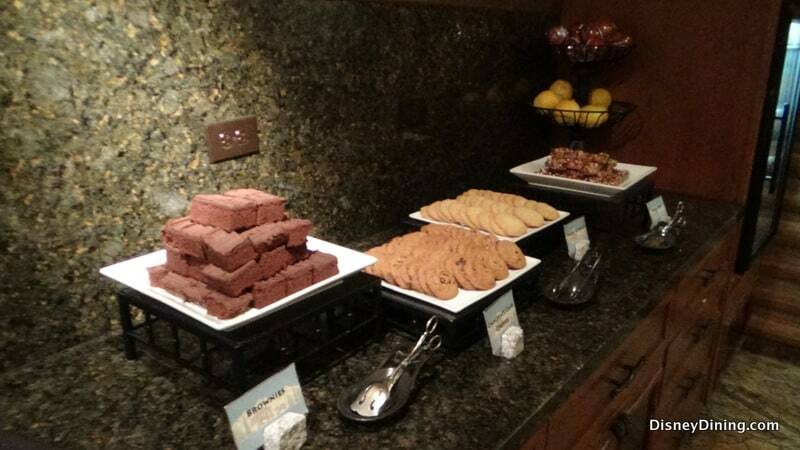 Just as tempting were the cookies, brownies, and cordials we had heard about from our research. The taste of the desserts didn’t quite match their reputation, though if I had to pick one it would be the berry cobbler. (Note: This is not the same cobbler offered at Artist Point.) 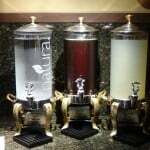 Of particular note, however, I should make mention of the cordials, and by that, I don’t mean chocolate candy. 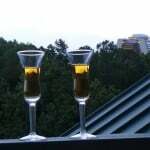 Some you can add to a coffee, such as Kahlua or Amaretto, while others are best served straight up, e.g. 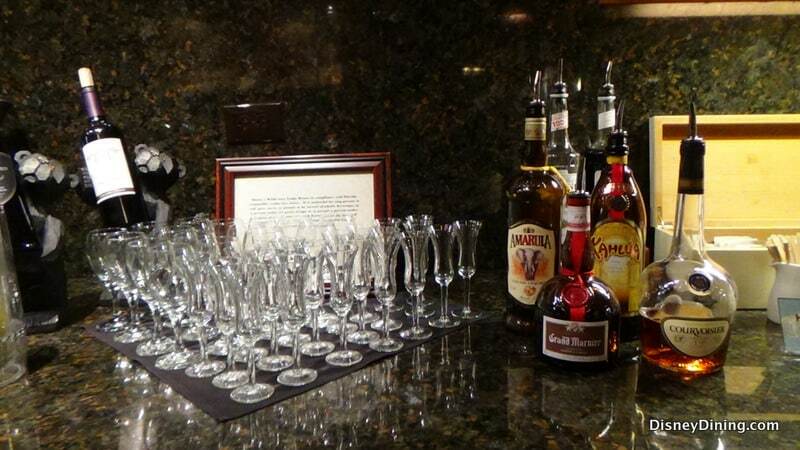 Grand Marnier or my personal favorite, Courvoisier, a cognac that can only be described as decadent. While not the top of the cognac list, it is a most excellent choice. 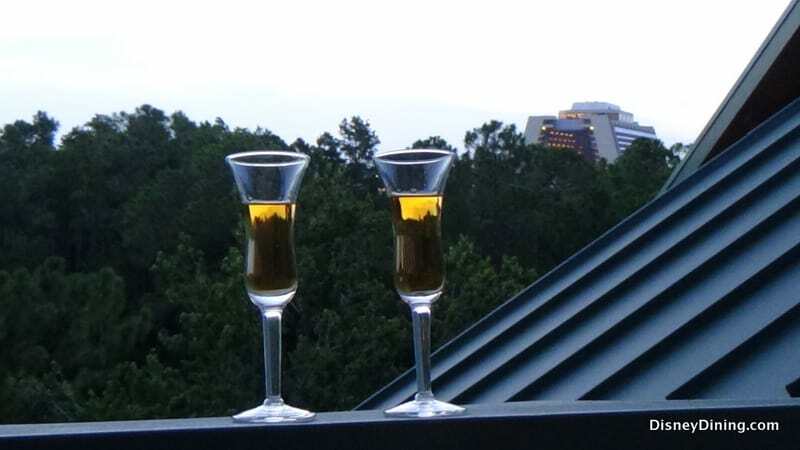 In fact, following our final bites of the cobbler, we grabbed a couple of cookies, two small glasses of Courvoisier, and watched the sunset from our balcony. That’s a proper way to end this review, and with that I deliver 3 stars out of 5 for the Old Faithful Club. 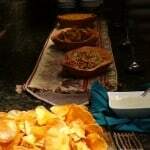 Food: The snack offerings are mostly responsible for the three stars. 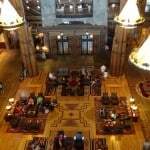 I realize that many folks are in the parks during the lunch hour so business is light, but then I might shut down the Club altogether during that time or offer a wider array of drinks besides tea, soda, or water. The foods offered overall were fresh, but some serious seasoning is needed. 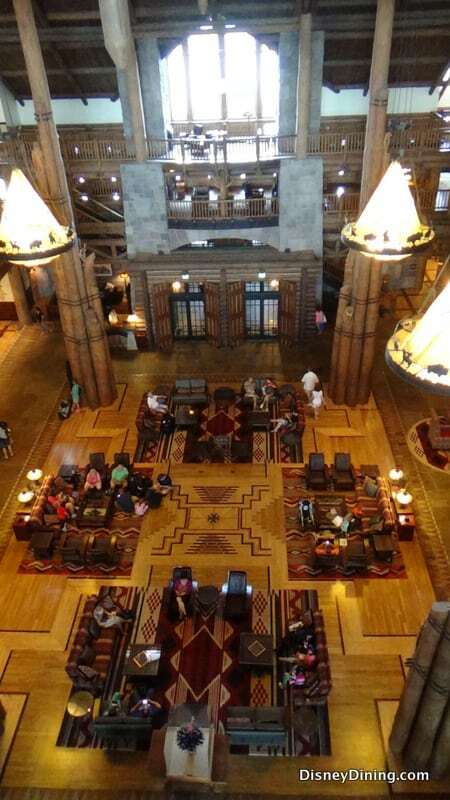 Atmosphere: It’s hard to beat being on the 7th floor of the Wilderness Lodge and being able to look out either over the entire lobby below you or see the geyser spouting off with much of Bay Lake behind it in the other direction. Great location, but you do pay for it. Service: Mostly non-existent. The staff does clean the tables scattered near the Club, and they do it quickly and efficiently. However, as this is a self-serve buffet, then service doesn’t really count here. Nonetheless, high marks go to the cast members we did see as they were exceptionally friendly. 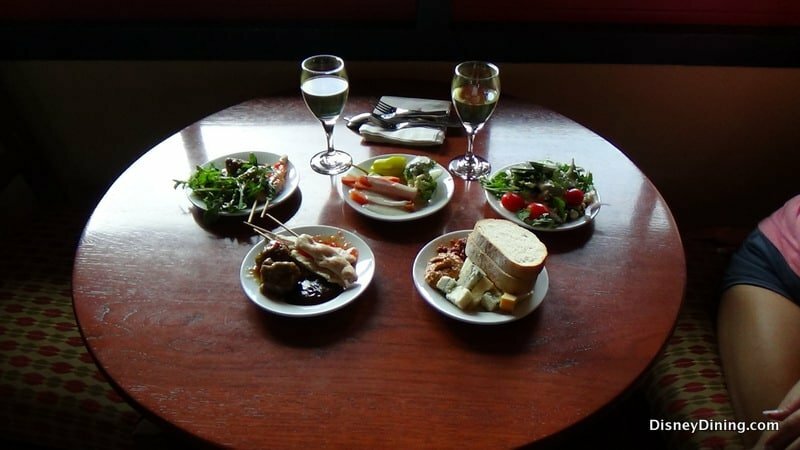 Tips: The buffet fills up quickly right when it opens, so it’s best to be there when the doors open or soon after. 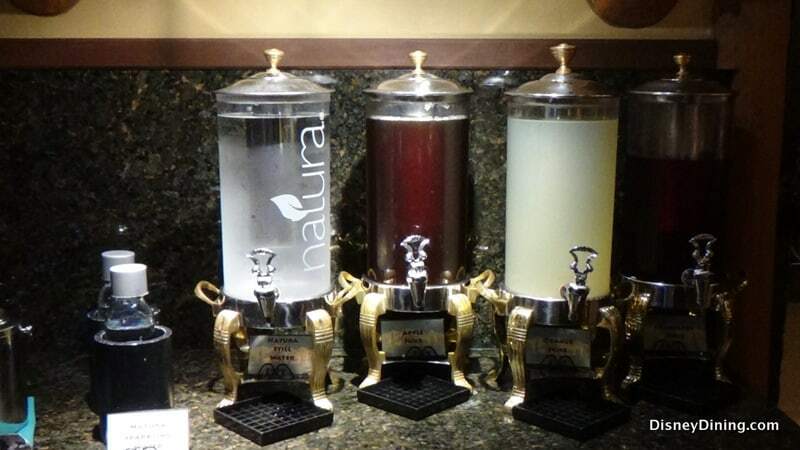 They do replenish the buffet items as needed; however, there can be a short wait if they run out of anything. The hours for each buffet are listed on the door to the Old Faithful Club. I’m retired Air Force, having served over 21 years on active duty. Because of my fairly extensive military travels, preparing, eating, and writing about food became a few of my favorite pastimes after running, biking, golfing, and hanging out around Disney whenever possible. My wife is a certified Disney-holic and foodie also, thus she helps feed our combined urges to create adventurous meals and to head south to Florida on a regular basis. In fact, we love Disney so much that we were married at our second home, the Wilderness Lodge, and dined at Artist Point for our reception. We are quietly planning what to do with our money once we win the lottery; I’m quite certain living at Disney for months at a time will be included.